A snow storm spawned traffic chaos in the Deep South leaving thousands of people stranded overnight on motorways, in schools and churches. Airports and roads were closed as five states declared emergencies. Military vehicles were deployed to aid stuck motorists and to reach those in need of food and water. Barely 3in of snow caused havoc in a warm-weather region where many cities do not even have snow ploughs or fleets of salt trucks. Hundreds of road accidents were reported, a number of them involving trucks jackknifing on highways. Despite ample weather warnings, school officials waited until the middle of Tuesday when snow was already falling to send students home on routes where traffic was grinding to a halt. Nearly 8,000 students across Georgia and Alabama spent the night in school gyms or on buses, reports ABC News. Many commuters abandoned cars along jammed motorways to seek shelter in churches and fire stations. Gridlock on the streets of Atlanta, Georgia, was so bad that a police officer had to deliver a baby on a snowy motorway. Georgia Governor Nathan Deal said on Wednesday morning that the National Guard had sent military Humvees on to the city’s motorways to move stranded school buses and provide food and water to people. A school bus flipped over as it was driving students home amid dismal weather near Asheville, North Carolina. Motorists were instructed to stay off roadways in Louisiana, Mississippi, Georgia, North Carolina and South Carolina, where states of emergency were declared. “Residents should not overreact but should make plans now to ensure they are prepared for prolonged freezing conditions and icy roadways,” Mississippi Governor Phil Bryant told US media. 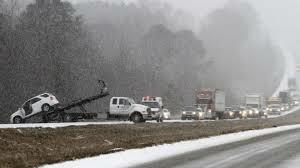 At least five people were killed due to weather-related accidents in Alabama on Tuesday. New Orleans’ main airport, which was closed on Tuesday, has reopened with a reduced service. Some 1,700 flights across the US were grounded on Wednesday. State legislature activities in South Carolina were also cancelled due to weather. The latest cold snap stretched across much of the US on Wednesday, sending temperatures as low as -30F.